… unless that organisation makes the effort to proactively ask them for their feedback. Yet the bad news is these unhappy customers are more than happy to tell others; research shows Karl Albrecht (The Service Advantage, Dow Jones, New York, 1990, p. 199) they will tell at least 15 other people about their sub-standard experience. And with the continued rise of review sites and social media channels, never before has it been easier to post a disgruntled rant to your ‘followers’. An organisation out of touch with the sentiment of their customers is an organisation in trouble. Brand positioning that doesn’t resonate. The good news is that, if asked in an appropriate way, most customers will be happy to tell you their opinion. You just need to give them a voice. Indeed seeking feedback from your customers will deliver you a rich vein of actionable insight and ideas to help drive your business forward and stay ahead of your competitors. According to a study by the University of Michigan, companies with the most satisfied customers have financial results that dwarfed the Standard and Poor’s (S&P) 500 Index. Their study showed that companies with the happiest customers gained in value by 75% over a 5 year period Vs just a 19% gain over 5 years for companies on the same Index with average customer satisfaction levels. When the linkage between financial performance and customer satisfaction is so clear and compelling, there’s no reason to second guess your customer’s views and no need to play Russian roulette with key business decisions regarding your customers. A smart approach is to surround yourself with actionable customer insight and analytics from PeoplePulse. 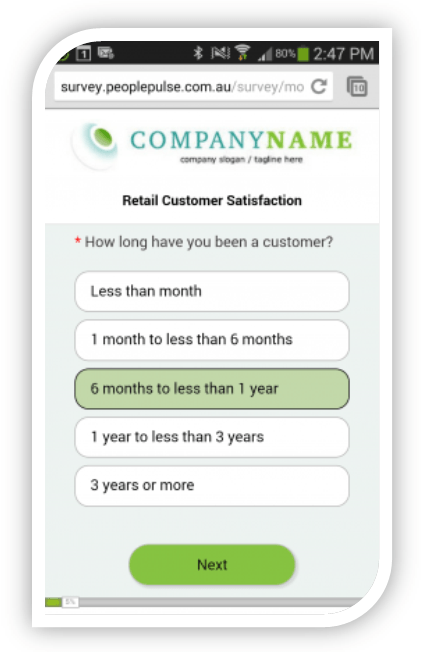 PeoplePulse’s customer surveys can be mobile optimised to enable your customers to give you feedback from anywhere at anytime. Save time when analysing free text comments with our automated word cloud functionality. Your customer’s most common words or phrases can be highlighted and analysed with the click of a button. Our Project Managers have extensive experience in the set up and delivery of best in class Customer Satisfaction Survey Projects. Their role is to ensure your survey runs in an efficient and effective manner from start to finish. Quickly pinpoint key satisfaction drivers. Easily identify strengths or weaknesses. Filter customer results by location, division, date or whatever variables interest your organisation. Our reporting is fantastic! Whilst many organisations collect feedback from their customers, a surprising few take advantage of the opportunity to directly grow their sales. 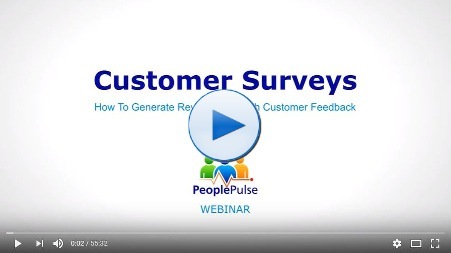 Watch this free online webinar for 6 smart and practical ideas to help you generate revenue through your customer surveys. This combination of exceptional software and unmatched support & advice works to ensure that your customer satisfaction survey is set up professionally without fuss, and that ultimately your survey delivers you the insight you need to make better business decisions.